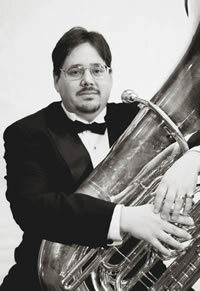 Sept. 21, 2009 -- The Department of Music at Arkansas State University in Jonesboro will present guest artist Dr. Angelo Manzo in a tuba recital on Monday, Sept. 28, at 7:30 p.m. in the Fine Arts Center Recital Hall, 114 S. Caraway, Jonesboro. Dr. Manzo will be accompanied by pianist Peter Miyamoto. The concert is free of charge and open to the public. The concert will include performances of “Sonata” by Henry Eccles, “Sonata No. 2” by Niels Gade, “Allegro Fuoco” by Roland Szentpali, “Concerto” by Alexander Arutiunian, “How Beautiful” by Barbara York, “Chant” by Brian Kehlenbach, and “Ragtime” by Rolf Wilhelm. Angelo Manzo has been a member of the music faculty at the University of Missouri (MU) since 2001. He teaches applied tuba and euphonium, directs the MU Tuba and Euphonium Ensemble, and performs with the University of Missouri-Columbia Faculty Brass Quintet. He holds a Bachelor of Music degree from the University of Puget Sound, a Master of Music degree from Baylor University, and a Doctor of Musical Arts degree from the University of Texas at Austin. During his career, he has performed on television and radio with professional brass quintets and symphonies. As a soloist/artist he has appeared at a variety of tuba and euphonium conferences, including the Great Plains Regional, Midwest Regional, Mid-South Regional, and Southern Regional conferences. Dr. Manzo is very active throughout the United States as a recitalist, clinician, and adjudicator. Most recently, he has given master classes and performances at several American, Albanian, and Russian universities, including the University of Kansas, Oklahoma University, Kansas State University, Texas Tech University, Oklahoma State University, Boise State University, Akademia e Arteve (Tirane), Galeria Jozef (Durres), the Moscow Conservatory of Music, the Gnessin Institute (Moscow), and the Mussorgsky School of Music (St. Petersburg). Currently, more than twenty of his works for tuba and tuba/euphonium ensemble are published by the Tuba-Euphonium Press. 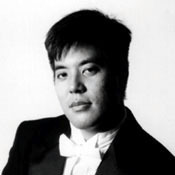 Pianist Peter Miyamoto has already enjoyed a brilliant intern ational career, performing to great acclaim in Canada, England, France, Germany, Greece, Italy, Poland, Russia, Serbia, Switzerland, China, and Japan, and in major US cities such as Boston, Chicago, Indianapolis, Los Angeles, Miami, New York, Philadelphia, and San Francisco. In 1990, he was named winner of the Irving S. Gilmore Young Artist Award. He also won the American Pianists Association National Fellowship Competition, the D’Angelo International Competition, the San Francisco Symphony Competition and the Los Angeles Philharmonic Competition, and he was a prize-winner in the National Chopin Competition. Currently associate professor of piano and chamber music at the University of Missouri, Peter Miyamoto holds degrees from the Curtis Institute of Music (B.M. ), Yale University (M.M. and A.D.), Michigan State University (D.M.A. ), and the Royal Academy of Music (A.D.) in London. His teachers have included Maria Curcio-Diamand, Leon Fleisher, Claude Frank, Peter Frankl, Aube Tzerko, and Ralph Votapek. ). His CDs “Chopin: Ballades and Fantasies” and “A Schubert Recital,” both released on the label Blue Griffin Recording, have received outstanding reviews in major recording review periodicals including American Record Guide (January/February 2009), Gramophone (April 2009), and International Record Review (March 2009).